8-Bit « Phloggings will continue until morale improves…. My family decided on homemade gifts this year & looking around the internet I was inspired by the post: “Granny Squares aren’t just for Grannies: 8-Bit Afghans” on the GeekMom website. It was a great tutorial with lots of details, pictures & videos. I was almost tempted to learn how to crochet. They had made a Tardis using crocheted granny squares. Totes adorbs! They included patterns for Spiderman, Mario & Princess Unikitty. I know nothing about crochet, least of all how to use the word. (Crochet, or crocheted?) 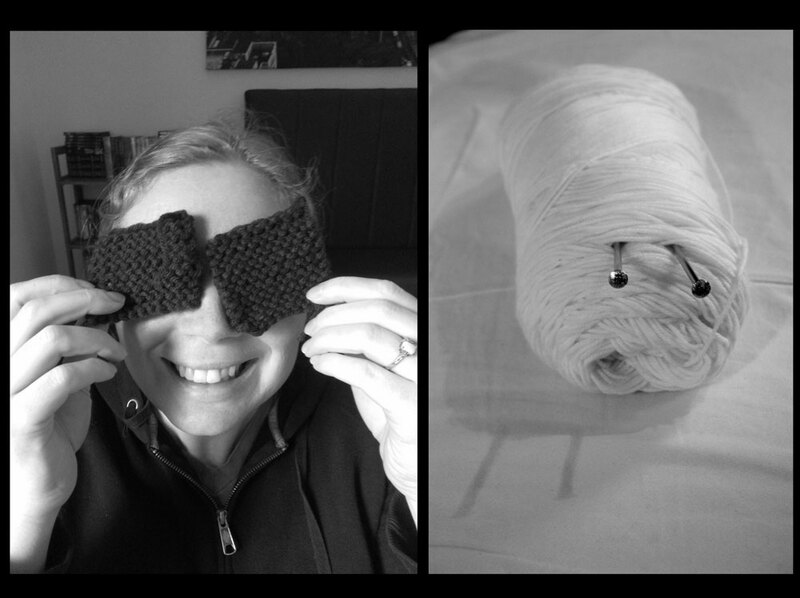 I do know how to knit & quickly decided I would knit squares into an 8-bit picture, but what picture? None of the patterns they had fit either my brother or nephew in the way I wanted. I started out looking for Batman or various Calvin & Hobbes pictures online, but none of them translated into the roughly 39×75 inch youth blanket that the website suggested as an appropriate afghan size. 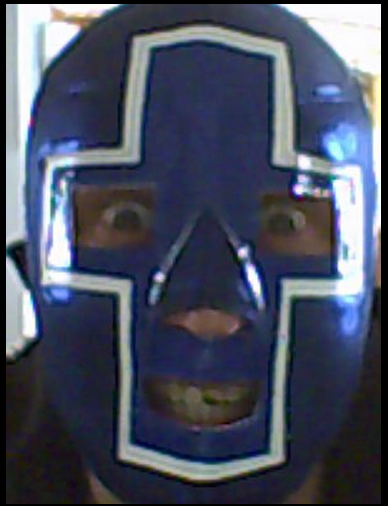 My brother Leigh in his Lucho Libre, or Mexican wrestling mask. He wears it at random times for parties, when swimming in lakes, hiking on mountain tops, & he’s worn it at a wedding. It translated perfectly & easily into an 8-bit pattern. You may have noticed this last image is shorter than the originals. I made that drastic change 8 hours before completing the project, which saved my sanity & 4 hours of knitting & sewing. 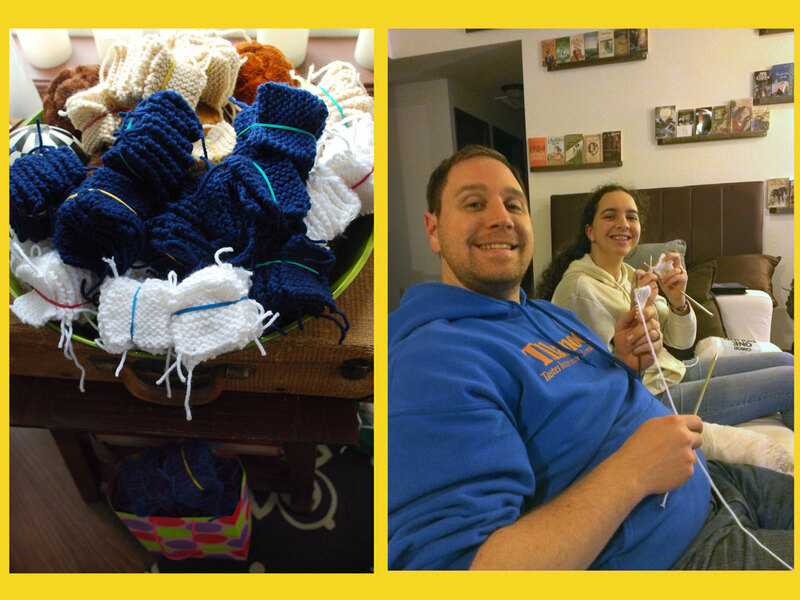 Below is a picture of the nerd knitting party we had. 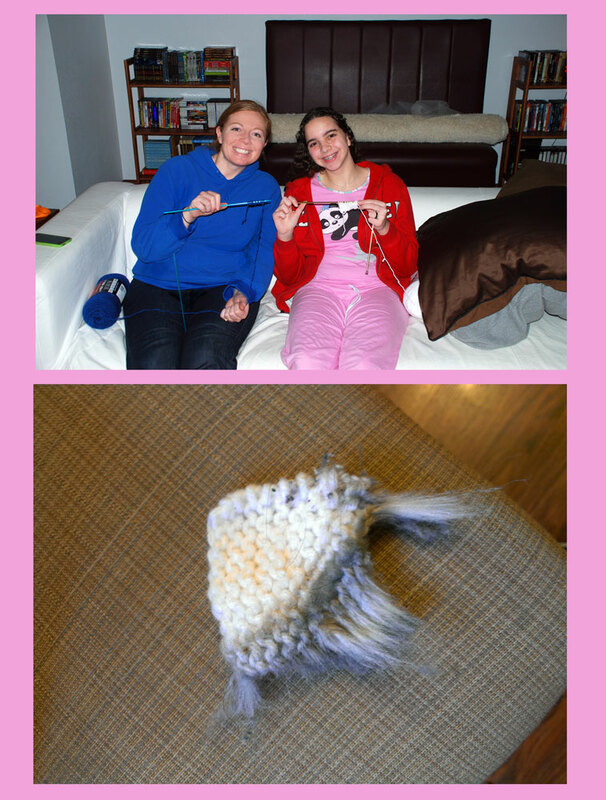 During this project I taught 3 people how to knit. 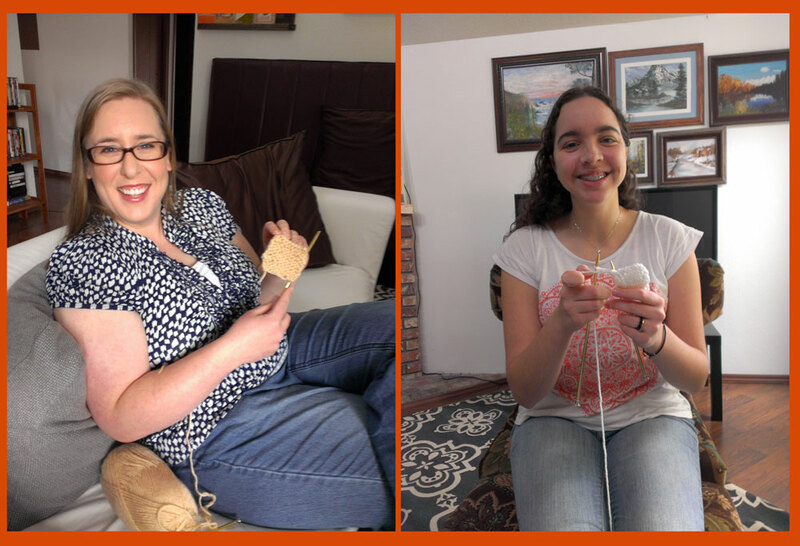 Our dear friend Loradona, our adorable exchange student Raíza & I also taught my supportive, amazing & talented husband Aaron to knit. 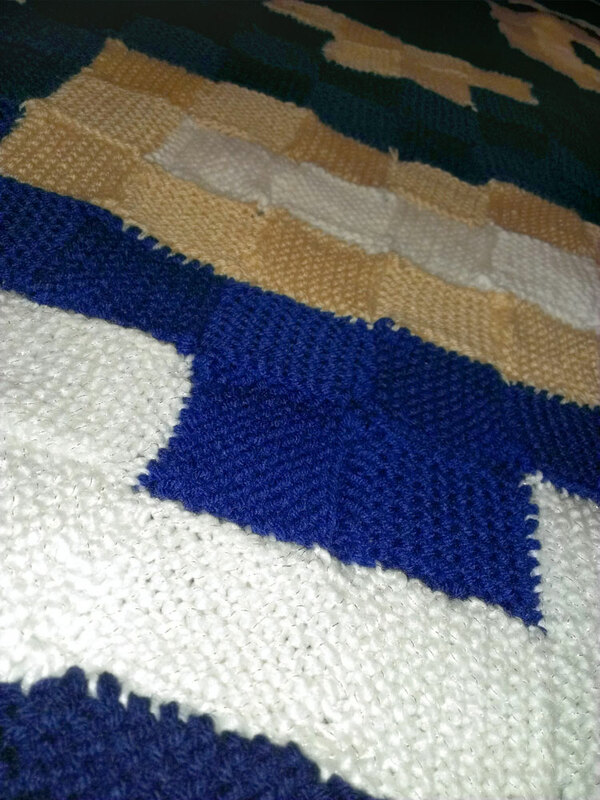 Using the website directions I figured that each square would be 2 inches squared & that would make the blanket 60 inches tall & 44 inches wide. Basically between a child & adult size. Once I was into the swing of things I could get about 5 squares done in an hour (don’t do the math), & with all that knitting things got a little weird around here. All I could see was yarn & little pet yarn slugs with knitting needle eyes. Once we had 10 squares of any color I would rubber band them together making it easier to count. We ended up with piles & piles before I just started sewing them together. Aaron did most of the white squares with Raíza helping. Loradona did flesh colored squares & I filled in the rest, including the big brown eye squares. We did have one casualty during our 33 day battle. The Roomba found this poor abandoned white square under the couch. These two pictures were taken about 8PM on Sunday, December 21, when we were still energetic. We let Raíza go to bed at a reasonable hour, but Aaron & I continued to work on the project until 4AM Monday, December 22. Four & a half hours after that Aaron was at the post office mailing the package to Minnesota, while I danced it up at Zumba. Done & done! WOW! It’s very exciting to see a tutorial from GeekMom put to use. 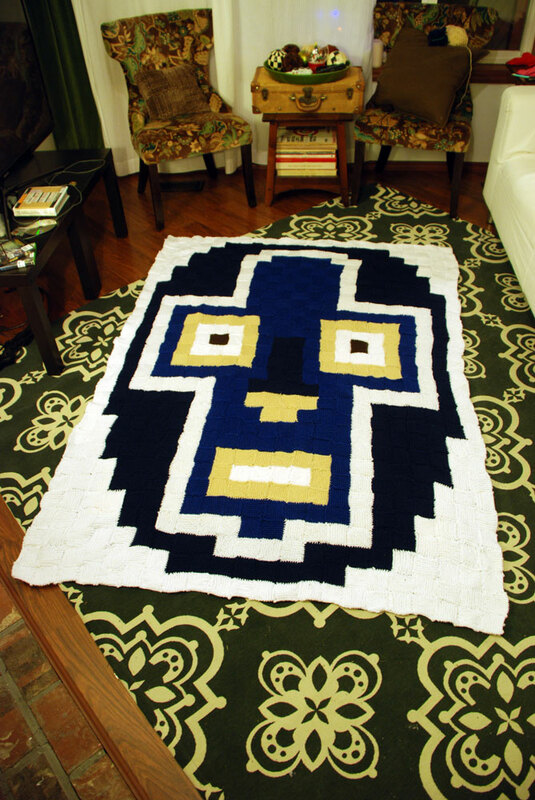 I’m glad you liked it – and I LOVE LOVE LOVE what you did with your 8-bit afghan! Hykel this is beyond amazing! 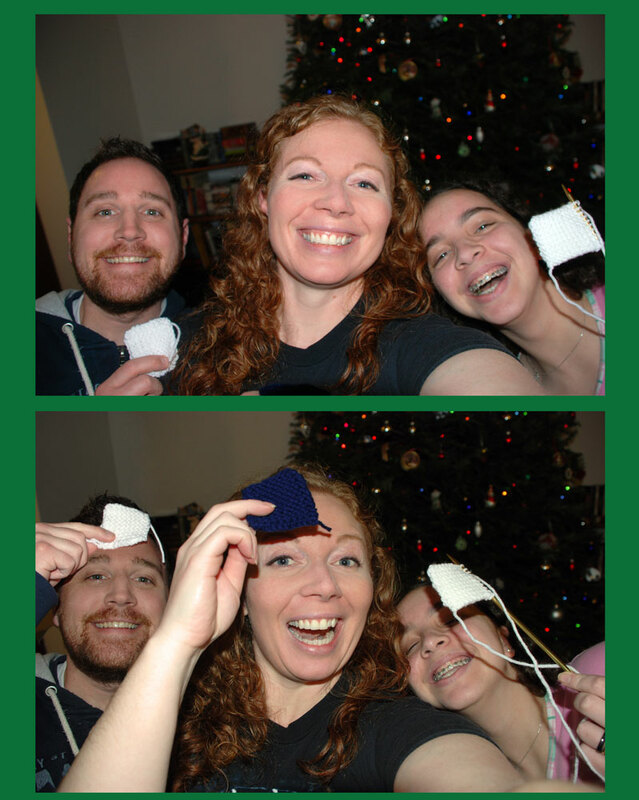 When I saw the photo of Leigh and family holding the blanket up I thought you had made it with cloth quilt block squares. Not even close! What a project! It’s fun that so many people helped and learned to knit. What a fun project and gift!